Hollywood is always late. Years before a rain of zombie movies flooded theaters around the world, a bunch of zombie-lovers created an annual zombie-gathering in New York. If my dead brain doesn't fail me, I was there in 2005, dragging my rotten flesh around the city with a bunch of crazy zombies that took over Manhattan streets for a whole day. It's an unforgettable experience, hundreds of zombies with a mission enjoying the daylight. 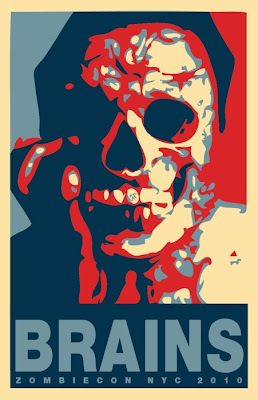 In fact, the gathering goes beyond the zombie-mania, as the organizers explain in their website: "We gather once a year to attack NYC in a theatrical, absurdist parody of blind consumerism and brainless politics. Each year, we choose a theme to resonate with the times and attack city landmarks accordingly, stopping frequently for brains and beers". I had a blast! thank you for writing about it! Soy un enamorado platónico de esa ciudad y temo perderme demasiado en lo típico y tópico. Por ahora ya me han recomendado Halloween por el lower east side y el village, que me ofreces?? perdona tengo el blog pelín abandonado por temas varios, vuelvo a NY a primeros de nov, prometo retomarlo con propuestas originales.